This is a beautiful book from a literary perspective. It’s a bittersweet story told in an interesting format with flowing language and engaging characters. I was enchanted. 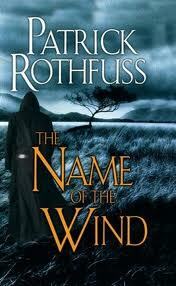 Patrick Rothfuss has set this up as a trilogy. A hero, mythic figure, and outlaw hiding from himself as much as he is hiding from the world tells the story of his life as he would like to be remembered. It is a common literary device, but in this book it is handled with a grace, and elegance, that enhances the overall story telling. The world of this novel is older than its history. Pieces of the before times are left in fairy tales and children’s sing songs. But the world that was before is not entirely gone. That violent magic touches our hero when he is a youth and it gives his life purpose. Magic, or rather Arcania, is present in this world and studied in all its forms at the University Arcanum. This school has some of the charm of Hogwarts and some of the student body dynamic of Lord of the Flies. Boys in competition are not always kind to each other and punishments for getting caught at misbehavior include taking lashes at the post. This was not an easy life, and the story is told with an honesty that makes it all the more compelling. As Kvothe, the storyteller, explores his own life he talks openly about the moments that were hints of who he would become. Trained as an entertainer, he takes us to the crossroads of his life. We, the readers, debate his choices and their consequences along with him. In his telling it is clear that the man is reviewing his own culpability in becoming the legendary Kvothe. Kvothe has said it will take him three days to tell the tale. This is the structure of the trilogy, and so this first book is the story of the hero’s childhood. Set against the frame of a man who is apparently waiting to die the adventuresome spirit and insatiable curiosity of the boy is poignant. The occasional breaks in the story where we return to the present are both a relief and an emphasis of how far this child has to travel. They also give the characters hearing the story and the reader a chance to breathe and to sympathize with the little boy who was. When I picked up this book I hoped that the trilogy was complete. This book does stand alone, even as it makes the reader beg for more. Sadly the author’s life intervened and the second book in the trilogy was just released last year. The author’s web site is encouraging about his work on the third book and I can only hope he will finish it soon. Although I suspect that even if quite a bit of time goes by a re-reading of this novel would not be diminished by the change of perspective that passing time inevitably produces. Yet another underlining of one of the books themes.